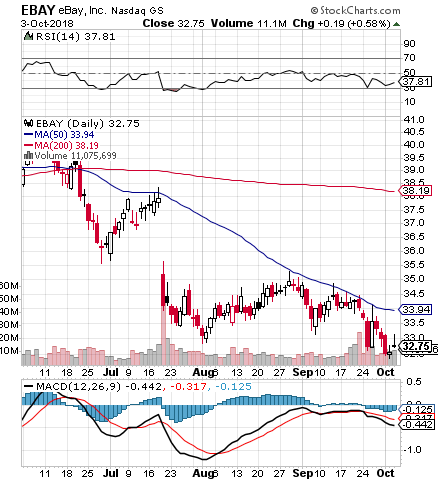 Blue Horseshoe Stocks: EBAY Ready For Reversal? On our routine morning scan today we noticed that EBAY, on Tuesday, registered a new annual low. The stock is at its lowest share price since April of 2017, and as our readers are well aware, we’re always on the hunt for a good bottom-play. What we typically do in these scenarios, is signal a range of options calls with a moderate amount of time remaining until expiration. 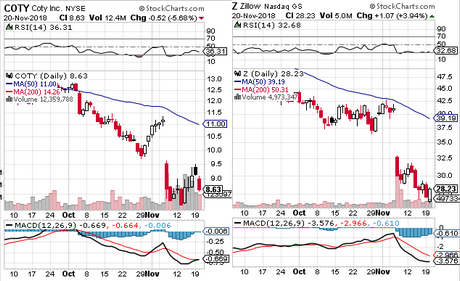 In this case we’re going to designate the EBAY 11/23 $33-35 Calls as our items of interest. As you can see on the included chart, the relative strength is rising and the MACD has begun to converge toward a bullish cross. Coupled with Tuesday’s annual low and a sizable gap to fill on the order of roughly two dollars, and it makes EBAY an attractive bottom-bounce candidate. We also like to look for opportunities on the heels of large companies reporting their earnings by highlighting options with weekly expiration, and that’s wjhat we want to do with STZ this morning. We’re going to track the STZ Weekly $212.50-220 Calls through today and tomorrow’s sessions.